Wrap your rifle-length AR15 with an overmolded forend and make it a combo with a pistol grip. Grab your Hogue AR-15 Kit Rifle-Length Overmolded Forend and Matching Grip. This kit includes a Hogue Rifle Length AR15 Overmolded Free Float Forend and Overmolded AR15 pistol grip. Multiple colors available! The Hogue Overmolded AR15 pistol grip features a durable fiberglass core that is “overmolded” with rubber for an unsurpassed combination of durablity and comfort. This grip retains the important lines and aesthetics of the AR – it still looks like an AR – all the while providing a comfortable and lightweight non-slip rubber grip with finger grooves and palm swells. It still looks like an AR. Both products feature a state of the art rubber elastomer grip material won’t harden with age and resists damage from oils and solvents commonly found around your firearms. This forend’s durability will provide years of dependable service. Very high quality fore end and grip. Grip is amazing. Also colors are very cool. Feels and looks great. My only issue was the installation, broke two strap wrenches and ruined a leather belt. I am very happy with the Hogue overmolded fore end and grip, The fit is great it was easy to install, and makes my rifle look real slick. The shipping was extremely fast, overall a great purchase experience!! Can't say enough good stuff about it! 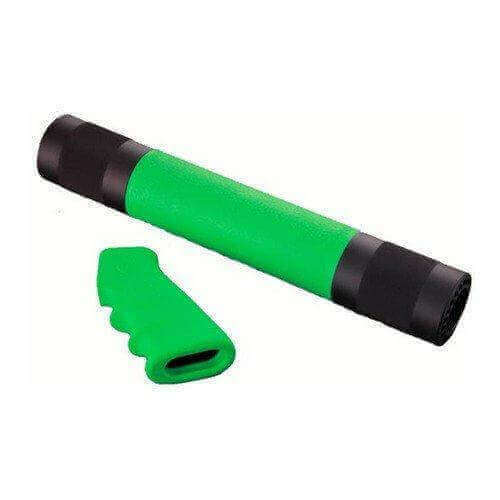 The Hogue overmolded tube is sturdy and rigid and feels nice in the hand. The pistol grip is the nicest I've ever felt for an AR; and that includes Ergo and Magpul grips. Everybody who handles my SPR equipped with these envies it! I'm going to get Hogue pistol grips for all my rifles. A few minor quibbles: 1) The pistol grip looks like a storage cap would fit it. Would be a nice bonus if they'd include one. 2) The "Ghillie tan" camo pattern was good on the pistol grip, but almost nonexistent on my tube. It's pretty close to Magpul's FDE, and matches my FDE furniture pretty well, but if I wanted plain FDE that's what I'd have ordered. 3) I saw Hogue makes an optional mount for 3" quad rails at the forward end of the tube, but the price is crazy - more than the tube! I'm going to drill and tap it and mount some rails myself. Finally - I thought Brownells' service would never be surpassed - they shipped me a barrel in 3 hours. BUT YOU DID IT! My last order from AT3 shipped in two hours - you guys are the best!